When you ask a resident of greater New York and/or New Jersey about the greatest television shows of all time, odds are that The Sopranos will be named by the person within a few seconds. 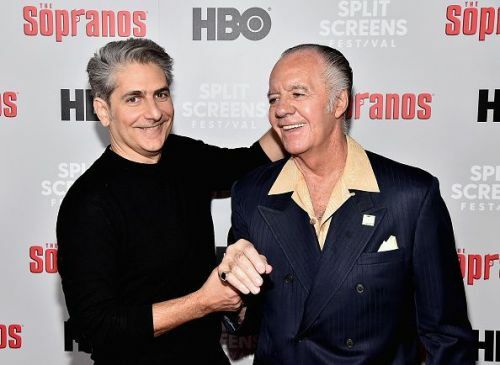 While The Sopranos stopped making new episodes more than a decade ago, many of the Sopranos cast members continue to work steadily. After the end of The Sopranos, Michael Imperioli was a regular on Life On Mars, then Detroit 1-8-7 and then Californication. And that is without factoring in multi-episode arcs on Hawaii Five-0, Blue Bloods or Lucifer, or appearances in close to a dozen films. But not everyone realizes that Michael Imperioli — who appeared in Goodfellas, Bad Boys, Clockers and The Basketball Diaries prior to landing work on The Sopranos — is also an in-demand writer, producer and director. He notably co-wrote and co-produced the film Summer Of Sam beyond writing a lot of episodes of The Sopranos. 2018 saw the release of a novel by Imperioli titled The Perfume Burned His Eyes. Still notably associated with The Sopranos, Michael Imperioli will be performing as part of Sinatra Meets The Sopranos at New York’s NYCB Theatre at Westbury on May 4th. The Sopranos star will be seen alongside castmates Steve Schirripa and Vincent Pastore, in addition to singer Michael Martocci and host/comic Joey Kola; the Sopranos actors will be telling stories and answering audience questions about the acclaimed David Chase series while Martocci will be performing actual arrangements from Frank Sinatra’s long-time conductor and musical director Vincent Falcone. Below are martial arts-related highlights from my phone chat with Michael Imperioli, while more of the chat can be read via The Hype Magazine. I’ve read that you’re skilled in terms of martial arts. Is that something that you’ve been doing your whole life? Or something you picked up later on? Michael Imperioli: I started in 2002, in my late 30s, just as an effort to get in shape and it’s something we did as a family. There’s a great teacher in New York, his name is Grandmaster [Tae Sun] Kang, and he and his family became really good friends of ours. It just really helped us, both in our minds and physically. Martial arts is really good for mental discipline. I’m not a full-contact fighter, I do it more to stay in shape. And that had nothing to do with being a sports fan or being into MMA? Michael Imperioli: No, it’s something I always wanted to do. But one of my kids started doing it, and then the other two kids started doing it, and then my wife and I started. We’ve been pretty much doing it ever since. If I’m correct, you’ve also got a theater company? Michael Imperioli: I don’t have the theater company anymore. We sold it after the economy collapsed in 2010… I miss doing it, I’d like to do it in the future. Well, what I was getting at is that you really have a lot of different projects that are going on and you sound like a very dedicated, family-oriented person. I’m curious if there are any hobbies though on the side, or anything that we didn’t cover that you wish more people knew about you. Michael Imperioli: My hobby is work. I don’t really have hobbies that I do to relax. Martial arts I don’t find as much of a hobby as personal discipline. But my hobby is really work. And it’s always been that way your whole adult life? So finally, Michael, any last words for the kids? Michael Imperioli: Read books. (laughs) Books are becoming an endangered species in this digital age, you know? I think people should read more books, to be honest. Michael Imperioli: Yeah, sure. Read mine, but read lots of books. Darren’s writing has appeared in dozens of outlets including the New York Daily News, Inquisitr, The Daily Meal, The Hype Magazine, All Music Guide, Guitar World, TheStreet.com, Format Magazine, Businessweek, The Improper, the L.A. Times, and the Jewish Journal. He is a member of the SATW and the IFWTWA organizations as a food and travel writer. Darren is also the host of the “Paltrocast With Darren Paltrowitz” podcast, as co-produced with PureGrainAudio. He is also the author of the book “Pocket Change: Your Happy Money,” as published by Book Web Publishing.